Are you ready to go through some CHF practice questions? 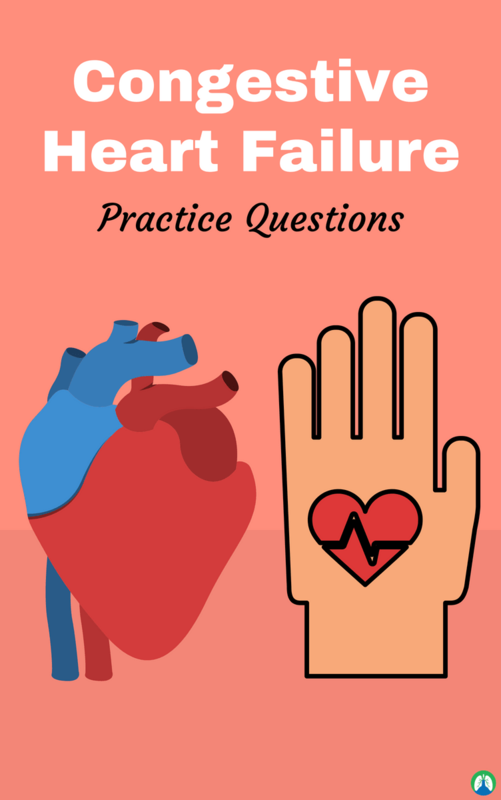 I sure hope so, because this study guide is loaded with practice questions and information that will teach you everything you need to know about Congestive Heart Failure. By learning this information now, it will help you throughout your Respiratory Therapy school journey and carry over for when you start seeing patients on your own as a licensed Respiratory Therapist. So are you ready to dive in? 1. What is Congestive Heart Failure? Congestive heart failure is a condition where the heart cannot pump enough blood and oxygen to the body’s tissues. It is a chronic and progressive inability of the heart to pump sufficiently to meet the body’s metabolic needs. Congestive heart failure is a heterogeneous syndrome in which an abnormality of cardiac function is responsible for the inability of the heart to pump blood at an output sufficient to meet the requirements of metabolizing tissues and/or to do so only at abnormally elevated diastolic pressures or volumes. It is one of very few cardiovascular diseases with increasing prevalence that is primarily due to higher survival of myocardial infarction, but there is also an increase in survival of heart failure patients due to better therapies. 2. What occurs with a normal heart? The heart pumps enough blood to match the body’s need for oxygen. 3. In congestive heart failure, the heart is not able to what? To move as much blood as it should with each beat. 4. In respiratory therapy school, congested heart failure is typically associated with what disease? 5. What common two causes of left-sided heart failure? 6. What are the forward effects of left-sided congestive heart failure? The left ventricle is unable to pump which causes decreased cardiac output, tissue perfusion, and tissue hypoxia. 7. What are the backward effects of left-sided congestive heart failure? Blood coming into the left ventricle cannot be pumped forward. Blood backs up into the lungs. 8. What is often the earliest sign of heart failure? 9. What are the three common causes of right-sided congestive heart failure? Left ventricle failure, pulmonary hypertension (cor pulmonale) and right ventricle myocardial infarction. 10. What is the forward effect of right-sided congestive heart failure? Left ventricle receives inadequate volume to pump so CO falls. 11. What is the backward effect of right-sided congestive heart failure? Right ventricle unable to pump forward so blood backs up in venous system is the main effect. 12. What is the goal of treatment for congestive heart failure? To decrease the heart’s workload and improve cardiac output. 13. Why are diuretics used for congestive heart failure? To decrease cardiac workload by decreasing the fluid volume that the heart has to pump. 14. When does congestive heart failure occur? It occurs when the heart is unable to pump sufficiently to maintain blood flow to meet the body’s needs. 15. What are the common causes of heart failure? Coronary artery disease, previous myocardial infarction, hypertension, atrial fibrillation, valvular heart disease, excessive alcohol use, and sepsis. 16. 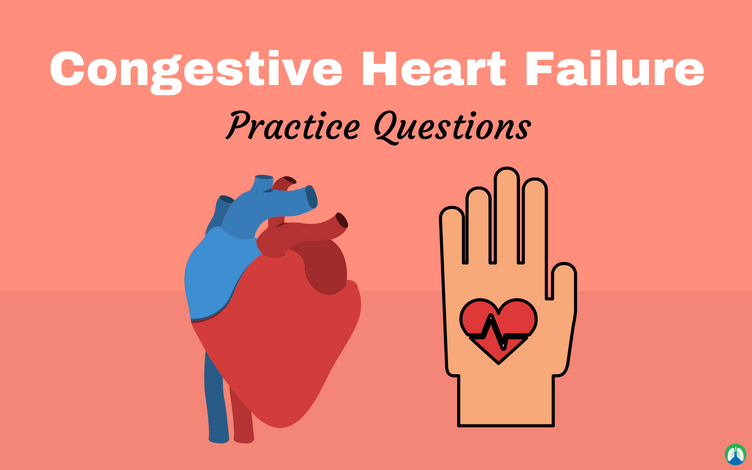 What are diagnostics used for congestive heart failure? BNP (B-type natriuretic peptide) measures the severity of heart failure, chest x-ray, and EKG. 17. What is left-sided heart failure? A left-sided heart failure happens when the left ventricle fails. This failure causes blood to back up into the lungs causing respiratory symptoms as well as fatigue due to insufficient supply of oxygenated blood. 18. What are the signs and symptoms of left-sided heart failure? Increase rate and work of breathing, rale/crackles heard in the lungs, dyspnea on exertion, and orthopnea. 19. What is right-sided heart failure? A right-sided heart failure occurs when the right ventricle has difficulty pumping blood to the lungs. It is often caused by issues within the pulmonary circulation such as pulmonary hypertension or pulmonary stenosis and backward failure of the right ventricle leading to congestion of systemic capillaries. 20. What are the signs and symptoms of right-sided heart failure? Peripheral edema, ascites, liver enlargement and jugular vein distention. 21. What management is available for heart failure? Diuretics, anti-hypertensives, smoking cessation, fluid restriction, and low sodium diet. 22. How much of the thoracic cavity should the heart cover? 23. What is traditional congestive heart failure? The syndrome in which carbon monoxide does not keep pace with peripheral demands for blood flow and oxygen cannot get to the organs for the body. 24. What early signs can be observed in patients with congestive heart failure? Reduced exercise tolerance (early fatigue). 25. What can be expected in patients with congestive heart failure? 26. What may be the principal manifestation of nearly every form of cardiac disease? 27. How many deaths occur each year due to congestive heart failure? 28. How many hospitalizations occur each year due to congestive heart failure? 29. What percent of patients diagnosed with systolic congestive heart failure will still be alive within five years? 30. How is congestive heart failure characterized? Intravascular and interstitial volume overload and manifestations of inadequate tissue perfusion. 31. What are signs of intravascular and interstitial volume overload? Shortness of breath, rales and edema. 32. What are symptoms of inadequate tissue perfusion? Impaired exercise tolerance, fatigue and renal dysfunction. 33. Approximately how many people have congestive heart failure in US? 34. What age comprises 75% of the patients with congestive heart failure? 35. What are five possible causes of left-sided failure? Ischemia, hypertension, myocardial infarction, dilated cardiomyopathy and restrictive cardiomyopathy. 36. How does ischemia cause left-sided failure? Low blood flow causes damage to the heart myocardium, causing it to lose function as a pump. 37. How does hypertension cause left-sided failure? Hypertension causes left ventricle hypertrophy. A thicker wall is harder to oxygenate properly. Ischemic damage causes loss of pump functionality. 38. What is dilated cardiomyopathy (DCM)? Dilated cardiomyopathy is a disorder of four-chambered dilatation where all chambers are stretched too wide. 39. How can DCM cause left-sided failure? DCM causes the chambers of the muscles stretched to wide. This stretching of the muscles impedes the ability to contract, causing congestive heart failure. It is important to note that studies have shown that DCM patients may also have impaired Frank-Starling mechanism due to troponin mutation, which would be why you would not see the normal increase in contraction force due to increased stretch. 40. How can myocardial infarction cause left-sided failure? Dead cardiac myocytes cannot pump. 41. What is restrictive cardiomyopathy and how can it cause left-sided failure? Restrictive cardiomyopathy is a disorder in which the heart cannot fill properly. Thus the heart cannot pump sufficiently. 42. What is the primary consequence of left-sided heart failure? Pulmonary congestion is the direct consequence of left-sided heart failure. It is when the left side cannot keep up with the right where blood becomes backed up in the blood vessels of the lungs. 43. What intravascular pressure increases during pulmonary congestion? 44. What are four symptoms of pulmonary congestion? Pulmonary edema with dyspnea, PND (Paroxysmal nocturnal dyspnea), orthopnea and crackles. It is difficulty breathing lying flat. It is one of the signs of congestive heart failure. 47. What is heart failure a problem of? Back flow and forward flow. 48. What are the jobs of the heart and how does this relate to heart failure? The heart has to supply every organ and keep the lungs free of fluid. As soon as this is interrupted, we become symptomatic. 49. What is heart failure? Heart failure is a complex syndrome due to a structural or functional disorder resulting in an inability of the ventricle to fill with or eject blood leading to a mismatch in the metabolic supply and demands of the body. Simply, the heart is incapable of doing its job. There are many causes of this. Among them is caused by cardiomyopathy where the heart muscle, weakened by various causes, is not pumping enough blood (oxygen, nutrients) for the rest of the body to function normally. Most commonly, heart failure is the result from conditions of impaired left ventricular function. Another is when the heart is not able to meet the metabolic demands of the body due to its inability to fill or pump. Examples are hypertension causing muscles to hypertrophy resulting to the inability to fill and to supply the body known as diastolic dysfunction; and myocardial infarction where heart lost contractility leading to its inability to pump and to supply the body. 50. What can chronic heart failure result from? Chronic heart failure may result from a wide variety of cardiac insults. The etiologies can be grouped into those that impair ventricular contractility, increase afterload and impair ventricular relaxation and filling. 51. How prevalent is CHF? In the United States, 6 million cases with 500,000-700,000 new cases per year. 52. What is the mortality rate for CHF? There is 50% mortality within 5 years of diagnosis which is a higher mortality than the combined average for all types of cancer. While 10% mortality within 1 year of diagnosis. This disease is very debilitating, no quality of life at the end, and essentially bedridden. So there you have it. I hope these CHF practice questions were helpful for you and I know if you use and learn this information, it will help you immensely throughout Respiratory Therapy school and especially when it comes time to take the board exams. Be sure to go through these practice questions again and again until the information sticks. Thank you so much for reading and I will see you in the next post. Breathe easy my friend!